Chris Reed, ASLA, is founding principal of Stoss, which won the National Design Award for landscape architecture in 2012. 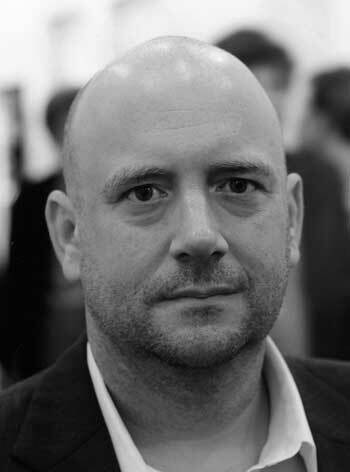 Reed is associate professor in practice of landscape architecture at the Harvard University Graduate School of Design. His most recent book, co-edited with Nina-Marie Lister, Affiliate ASLA, is Projective Ecologies. 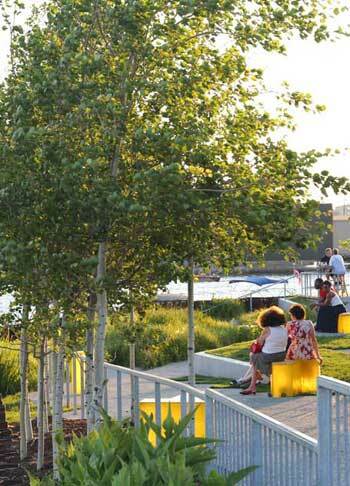 This interview was conducted at the 2014 ASLA Annual Meeting in Denver. You recently started work on Trinity Riverfront, a nearly 500-acre development in Dallas that will create three new neighborhoods set within a landscape of wetlands and gardens along the river, connected by light rail. You say this project will make Trinity floodplain “the most exciting public space in Texas.” Given what we know about car-centric Dallas, that phrase is a bit shocking. 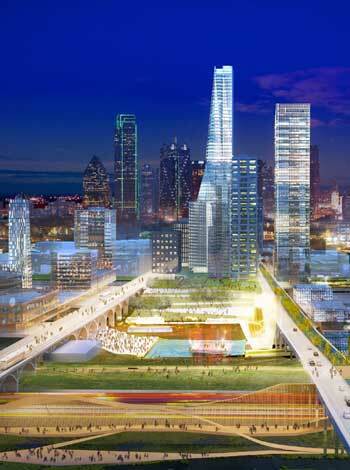 What do you think this project says about Dallas and where it’s going? Dallas is at this incredibly important turning point. It’s building right now on a very short legacy of rediscovering its downtown, the value of civic urban life and the arts, and the potential for landscape and open space to play a role. Over the last 10-20 years, philanthropic institutions, individuals, and the city government have created the arts district, with what are now very famous cultural attractions, museums, and theaters. All of these have been done by top-level landscape architects and architects from around the world, including Peter Walker, Lorenzo Piano, and others. In doing this, Dallas sent a signal to the world that they’re ready to play, right? Dallas now values urban life. They’re willing to put the money and the commitment behind it to make it happen. Since then, we’ve seen large-scale initiatives on the Trinity River itself, as well as smaller-scale initiatives in downtown, turning vacant lots and other city-owned properties into new public spaces. The riverfront work I’m involved in is the next generation of this. Dallas’ city government has found unique ways of doing creating projects: they team philanthropists with private developers, in concert with the city government, all coordinated by the urban design studio run by Brent Brown. The city has created an amazing coalition to help move really good projects forward. It’s all about rediscovering the center, the value of civic life, the value of being able to live and walk downtown to set a of cultural and open space resources. The riverfront work we’re doing occupies this gap between downtown and the Trinity River, the future Trinity River Park. It’s a messy area. It’s got old stormwater “sumps,” they call them. It’s got rail infrastructure, highway clover leaves. Really, a jumble, a mess. We’re trying to use landscape to frame out some of that infrastructure, to take some of it simply out of play. Within this new context of vibrant forests, water gardens and infrastructure, these will be dense, livable mixed-use neighborhoods, places to live, work, play. In some ways, Dallas has the opportunity to set a model for what is really the new normal for North American cities. If you think of San Francisco, New York, and Boston as being exceptions, places like Dallas, Atlanta, Houston, Phoenix, Denver, Toronto are 20th century metropolises. This work signals how we might tackle some of the problems faced in many other places. You’ve also been deeply involved in the Detroit Future City Project, which aims to create a more hopeful, long-term vision for this shrinking formerly-bankrupt city that still has so much potential. What is the vision of the future articulated by this group? What can Detroit be like in 50 years? Everybody talks about the problems associated with Detroit — the vacancy, the economic woes, the fact that it’s just gone through a bankruptcy. We wanted to see how we could turn some of the challenges into opportunities no other city has. Take vacant land, for instance. No other city have the quantity of land available within the city borders like Detroit has, right? That allows Detroit to do things that other cities absolutely cannot do. The city can treat stormwater on the surface through a set of blue and green infrastructure. We were just a small part of a very large collaborative team that worked for five years on the project. Our work looked at ways to take liabilities and turn them into assets. Everybody knows Detroit has a very active urban agriculture movement. We want to build on that energy. But we’re also very careful to say, urban agriculture alone cannot save the city. There’s too much land available and some of the problems go far deeper than just food. We’re not worried about the population. Seven-hundred-thousand people is a very large city already. We’re not worried if that goes up or down. For us, it was more how do we create the right economic opportunities? How do we create employment districts on the ground? How do we create the infrastructure that allow people to get from their home to their job? How do we create the training opportunities that take a largely unskilled labor force, and train it to be able to tackle 20th century and 21st century industries and opportunities? How do we begin to think about land use, neighborhoods, and landscape? This is where the project, from the land-use perspective, becomes quite interesting. Landscape becomes a significant component of the urban form of the city. Over 50 years, large areas will be given over to innovative and productive landscape uses, whether that’s blue and green infrastructure, food production, energy production, research, art landscapes, successional landscapes. Landscape becomes a robust contributing factor to define what urban life in this city can be in the next 50 years. This is an opportunity other cities don’t have, because they simply don’t have that land available. Landscape is a great starting point and driver for bigger questions. In Green Bay, Wisconsin, your firm completed CityDeck, a novel riverfront park that features a design filled with “folds,” as you call them. 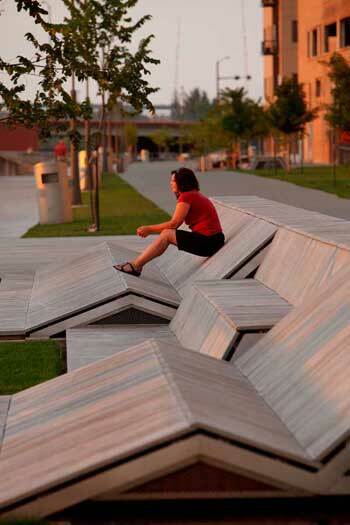 You say these folds create diverse seating types: benches, chaise lounges, angled decks. Your goal is to give people real choice about where to sit. Is this a new thing? Why is seating choice so important? The folds extended to larger-scale infrastructure that moved out over the water and brought you up to an elevated perch or down to the water. All of this worked together as a system at different scales. At the larger scale, the folds offers different opportunities for how to engage with the river. It was designed to create a very lively civic space that people want to come back to, because they can begin to experience the river in different ways each time they return. At the level of an individual, the folds are designed to be as comfortable when you’re there alone or just with a friend, as when you’re with a big collective of people, attending events. Ideas about choice and flexibility are really derived from the idea that we all have different body types, so we all want to sit in different ways. Sometimes that’s just the shape of our body and sometimes it’s mood-based. It’s important that a civic space give people these opportunities because otherwise people will create their own opportunities anyway, right? They will take a planter and find ways to inhabit it. They’ll take a bunch of rocks and figure out a way to lie down, lie against, put up a laptop. 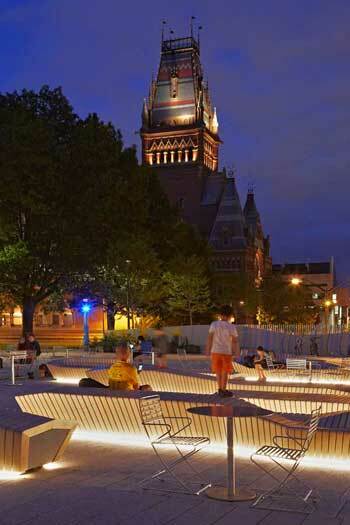 There’s a great opportunity to start to design that into public space. Some of these ideas go back to the writings and observations of William Whyte, who was really looking at the behavior of people and thinking about how to translate that into making lively public spaces. We take that research seriously. Some of our research began earlier with a playscape we did for a garden installation in Métis, where we wanted to fold rubber surfaces to allow people to play. We had encountered a certain level of resistance from public authorities, because they had never seen something like this. The installation at Métis in rubber gave us an opportunity to test it out and to document the various ways that people would kind of engage. Of course, kids are really good at it. They’ll make up games, you know? But adults started to get involved, too, and they’d roll up and down the hills and jump and dive. For The Plaza at Harvard University, you also create lots of seating choice — with movable café tables and chairs but also with these great ergonomic benches that enable interchangeable seating positions. These were made possible with 3-D parametric modeling and fabrication. Why did you want to reinvent the bench? And have people taken to them? Should we all be sitting on the same kind of bench all the time? The standardization process that marked the evolution of the 20th century made it cheap and easy to manufacture repetitive elements. What we got was the same bench repeated over and over again. Today, technology allow us to do something different. We can script out forms that use a set of components or techniques, but the overall form can change. We’re taking advantage of a set of technologies that allow us to make different variations, in this case, benches that appeal towards people’s desire to find their own place and what’s comfortable for them. The benches are sculpted in such a way so that people can lean back, sit up, sit with somebody in their lap, lounge back, snuggle. Kids can jump and play on them. People are able to inhabit these benches in any number of ways. In any one of those benches, if a single rib becomes damaged, it can be replaced because it’s numbered. All we have to do is go back to the fabricator, and they can very easily reproduce using their C&C machines and fit it right back in. The benches contribute to a public space people want to come back to over and over again. They’re wildly popular. In fact, we were getting phone calls the first day that university officials started to unwrap the benches. Students immediately started to sit on them, lie on them, do all the things that we had imagined. And it surprised the university administrators. They had a certain confidence in what they were telling us, but on the other hand, they weren’t sure if people would really do the things that we were imagining them to do. And they have. And so we’ve seen it on a daily basis and are documenting it. People really love them. The benches have become iconographic, but they’re also quite inviting. In a space really designed to host a lot of different events, the benches, in combination with the movable tables and chairs, allow for the accommodation of the every day. People feel like they’re invited to take part in this space. Your landscapes have a unique look. They’re angular, planar, folded, and often feature zigzag shapes. These shapes have a contemporary feel, a technological vibe. We sense these shapes are only made possible through the latest modeling technologies. Is your intent for us to see the technology, process, and the end-result in the design? What attracts you to this aesthetic? Where did it come from? We want to take advantage of all the best technologies available and use them to craft landscapes. But it’s not just about form-making, it’s about how these shapes can perform from a social and ecological standpoint. While we’re generating strong forms, they are influenced by how things need to work to create rich environments. Design should reflect the cultural ambitions and technologies available to us at that moment. This means the tools we use change, the applications we use change, and the shapes that emerge from those tools and applications also change. They signal a particular time, place, and cultural ambition. With landscape, somethings are age-old: how trees grow, how seeds move, how water filters through a landscape. For me, it’s about taking these new technologies in the forms and shapes they afford and allowing them to set up conditions where water, seeds, and plants, and even the movement of people begin to change. The tools set up interrelationships where it’s never just about the form but about what the form affords from a social, ecological, and economic point of view. Eerie Street Plaza is a great small riverfront park, a stop-off spot along a three-mile pedestrian and bicycle route in Milwaukee. It’s a designed landscape that’s also integrated with the ecological functions of the river. How does this project represent the new thinking on ecological systems outlined in your book with Nina-Marie Lister, Projective Ecologies? I think two things are at work. One is how we used underutilized resources available. In this case, stormwater, even river water, was redirected so we didn’t have to install a new set of water systems to first drain all the water that’s there away, and then second, introduce a new set of water outlets and run water to the site. We’re much more interested in being resourceful and redirecting something already at work. The second piece is an inherent flexibility and adaptability built into the project, which goes back to the design competition proposal that really appealed to the jury. The site was surrounded by not a whole lot of anything. The question was: what kind of public space should this be? There wasn’t really a local constituency to engage. So we developed a system through interspersed paving and planting that could actually be reconfigurable over time. It could change the combinations of hard and soft surfaces that were in the plaza, depending on future uses, desires, and activities. Some of the plants we embedded into the space could begin to inaugurate vegetal change. The plaza was set up with zones: low and wet, high and dry. Different plant materials occupied different parts of the site. As the site changes over time, there is this kind of inherent adaptability that’s designed into the project that’s really quite unique to a public space. These elements hint at the Projective Ecologies project, which looks at the opportunities involved in using complex, adaptive ecological systems and applying them to the design of public space. Can you get specific about the rise of more creative approaches to ecological research and design, as you and Nina-Marie outline in Projective Ecologies? What ideas are you most excited about? The book project is an opportunity to take stock of ecology and its relationship to design, as it has evolved over the last 20 years. But, also importantly, we want to look at how to reformulate the relationship between ecology and design moving forward. Ecology has become such a part of commonplace term that we think it’s important to step back, think critically about the terms we’re using, and then use that critical reflection to think about other pathways that might emerge. Visualization tools are one pathway. New tools and technologies are another. The technologies are often borrowed from other disciplines, like engineering or hydrology. We can take the modeling tools engineers use in a very analytical way and inject into them not just an understanding of how things work, but what we want them to do, right? We can begin to think creatively about manipulating water flow that could create new types of public spaces. Functions could perform ecologically, but create entirely new experiences within the city. The work Bradley Cantrell has been doing is really important. I’ve been experimenting in design studios at the Harvard Graduate School of Design where we use the program real flow aqua to model a set of water flows and then start to translate those into gardens and public spaces simply designed for the experience of those water phenomenon in an abstract way. They don’t necessarily have to simply perform in a functional way. They can perform in an experiential way. Bradley Cantrell’s work looks at multiple systems simultaneously and how the realms of design, ecology, and engineering can be modeled and mapped together. So, on the one hand, this becomes a common tool for people to work through some problems. But importantly, it also becomes a creative tool for designers to begin to think in different ways. Whether we are talking about new visualization methodologies, new tools and technologies, design labs and collaborative situations, or anthropology and social relations, these are all just different starting points for broader investigation that can inform design in the coming decades. We’re trying to find ways to push what is possible in contemporary practice. For landscape architecture to be relevant as a discipline, it needs to do more than just check the sustainability boxes. It needs to set out a broader set of cultural, social, and environmental ambitions that allow the discipline to evolve with an evolving world. Design can enable us to address some of the bigger challenges acted out on the world stage. 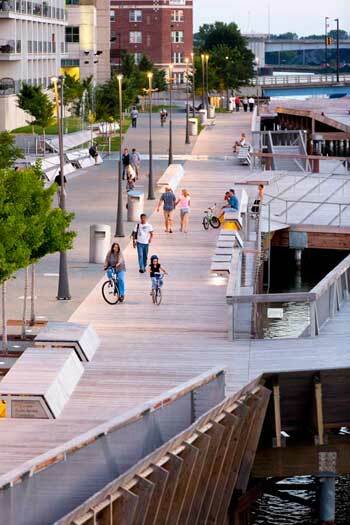 It’s an incredibly ripe opportunity for landscape architects to be leaders. But to take leadership, we need to be more expansive and creative about the way we think and practice. What is the difference between “infrastructure” and “green infrastructure” – definitions for both? Erie Street Plaza is a spin off of Highline. It is a solution that is not ADA considerate. I am amazed that this received accolades from many……………..
To see it in person is an awakening………..